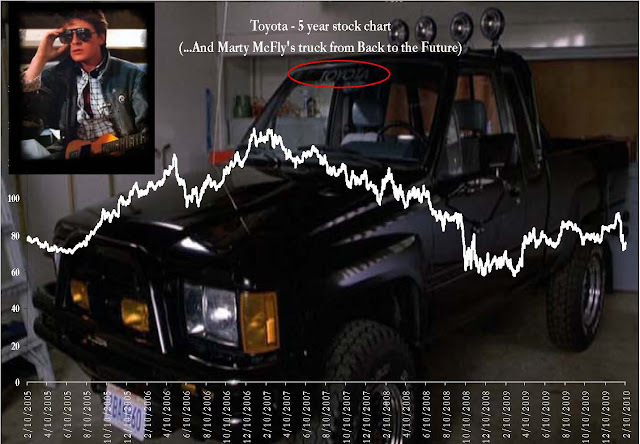 As Toyota shares have been creamed over the past weeks - the American Depository Receipts have plunged 17% in less than three weeks - some analysts are suggesting a bottom is in and people should buy the stock. Citigroup analyst Noriyuki Matsushima for one, has a $99.77 target for the ADRs. But a look above at peak earnings shows that to be a PE multiple of nearly TWENTY, on earnings that will be very tough to get back to. (The the exchange rate fluctuates, I used a 100-1 ratio for Yen to dollars). I'm definitely not overly pessimistic on the shares, especially if they can get back to the $2.50 range on their dividend. But I think the recall lead to a correcting that the shares needed anyway. How 'bout this classic beauty of a Toyota?